The 325 Series water blasting units are quintuplex versions of the 225 Series. What that means is that opposed to three plungers, these have five, allowing them to run at higher horsepower and produce higher flows. Because these units use the exact same fluid end components as the 225 Series, they are a perfect next step when higher horsepower is needed. Models are available ranging in horsepower from 272-336 kW (365 to 450 hp) and with pressure from 552-2 800 bar (8 000 to 40 000 psi). These units are all built around the 325 convertible pump. This pump, with its quick-change, in-line fluid end design, has fewer parts for increased operating efficiency and simpler maintenance. And, it requires only a simple conversion kit to operate at pressures between 552 and 2 800 bar (8 000 and 40 000 psi). The NLB 325 Series units are built to the exacting standards that have made NLB equipment the contractors choice for over 40 years. These trailer mounted units come standard with features like four wheel electronic brakes, full D.O.T. lighting package, and heavy-duty axles. All operating controls, including the pressure compensating by-pass valve and pressure gauge with snubber, are mounted on a separate accessory manifold, which provides additional protection for these important components. 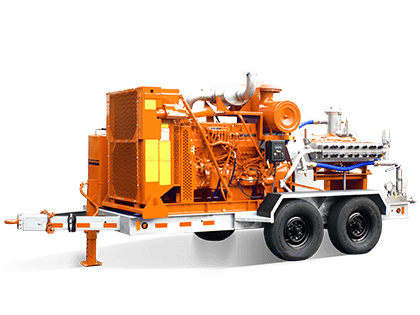 The 325 series units can be ordered in an UltraGreen configuration, assuring compliance with the latest Tier 4F emission requirements for diesel engines from the Environmental Protection Agency while significantly reducing operating costs.